As of this moment, Dayna Guerro is the lone New Mexico high school entry for the USA Cross Country Championships in Boulder on Feburary 15. Photo by Alan Versaw. 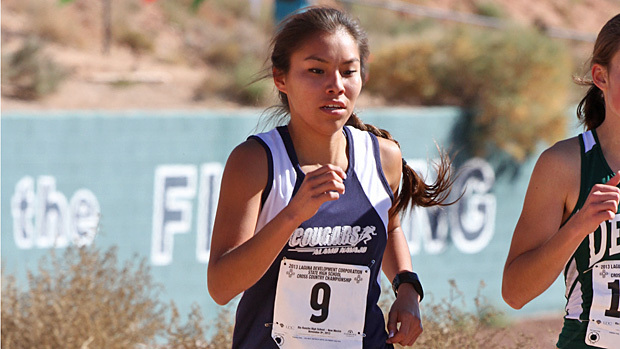 When the gun goes off on the Junior Women's 6K at the USA Cross Country Championships next Saturday, there will be at least one face familiar to fans of New Mexico cross country. That will be the face of Alamo Navajo senior Dayna Guerro. It will be Guerro's first effort at 6K, the same distance she'll see a lot of at the college level, but she doesn't seem especially unsettled about the additional distance. In addition to competing on the indoor circuit the last three weeks, Guerro reports that she has been "building the base of mileage. Being consistent every week with 40+ miles with a drop of pace 7:45 or lower per mile. " Guerro is aiming at a 23-minute effort next Saturday. The course is flat and fast and will involve three circuits for Guerro's 6K. Perhaps just as important, though, she aims to "have a little fun with what I enjoy doing every day." The 5300 feet of altitude in Boulder should present no new issues for Guerro. The field, though still relatively small with a few days of registration remaining, includes some of the top junior women in the United States--to include Katie Rainsberger, a top-six finisher from NXN. Although Guerro is the lone Junior representative from New Mexico, there are a few names familiar to the Land of Enchantment in older divisions as well. Among those are Dustin Martin, Steven Mills, Preston Charlie, Andrew Yazzie, Simon Gutierrez, and perhaps a couple more I may have missed in a quick scan. Racing begins at 8 AM with the Masters Women event. The venue is the Flatirons Golf Course on the east side of Boulder.